For his new film “Cast Away,” Tom Hanks, nicest guy in the universe, shed 55 pounds to play a plane crash survivor who spends 4 1/2 years alone on a desert island. How’d he do it? What an actor! What a guy! Hanks thinks it’s a dumb question, and he’s right. That unimaginative journalists keep asking it chaps him silly. At this point in his publicity rounds, sarcasm (see above) is his buffer from banality. Hanks looks hale and happy, natty in dark blazer and slacks, his familiar puffy eyes completing a vaguely cherubic face. He and four journalists sit at a circular table, like a forced dinner party, in a Dallas hotel suite. He sips coffee. It’s a credit to his forbearance and professionalism that Hanks doesn’t individually throttle us or excuse himself to the restroom never to be seen again. Public figures are geniuses at erecting deflective ramparts around their true selves. They have the persona thing down. No doubt Hanks is donning his force-field on this day. Still, flickers of personality escape the veneer. 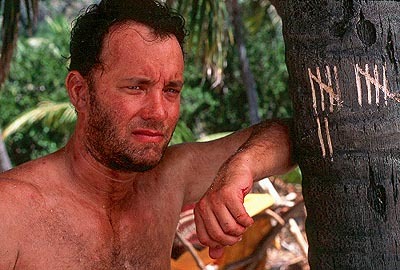 He summarily ruled out a traditional press junket for “Cast Away.” “I’m not going to sit in the chair and answer 57 times in one day how I lost the weight,” Hanks snorts. If only he had told us this at the beginning of the interview.